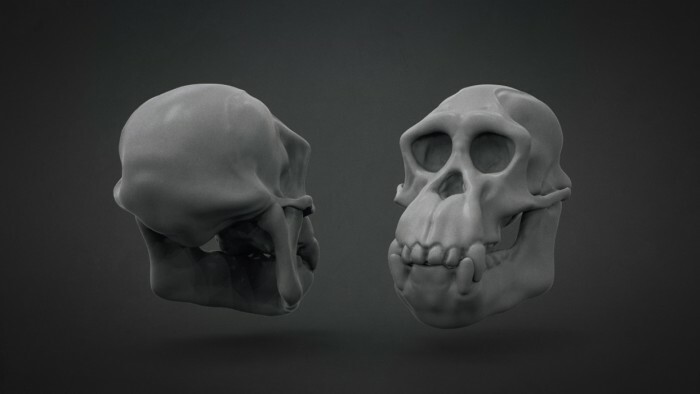 In this chapter we block out the top part of the chimpanzee skull with a Dynamesh sphere using 3D scans and photographic references for accuracy. 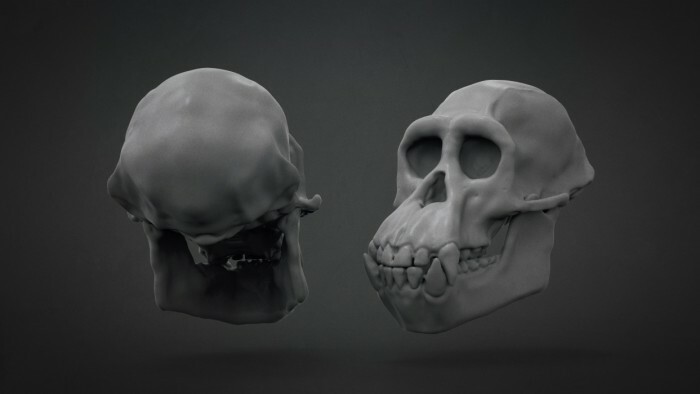 In this chapter we block out the jaw bone using a Dynamesh sphere and then continue to refine the top part of the skull using our reference as a guide to build an accurate study. 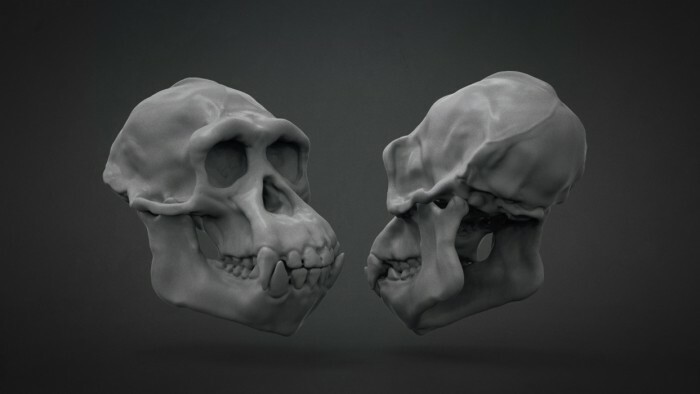 In this chapter we continue you to refine the skull, adjusting proportions where required and start to add more specific details and refinements from all angles as needed. In this chapter we continue to refine the skull and focus on more specific details such as the teeth bringing them a bit more clarity. 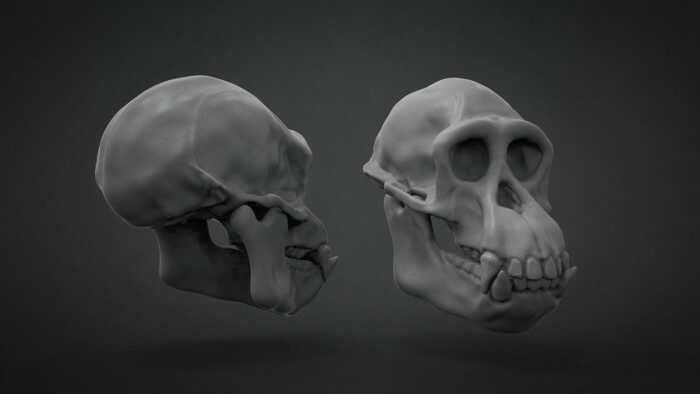 We also continue to adjust and refine overall proportions where needed as we continue to study our reference. 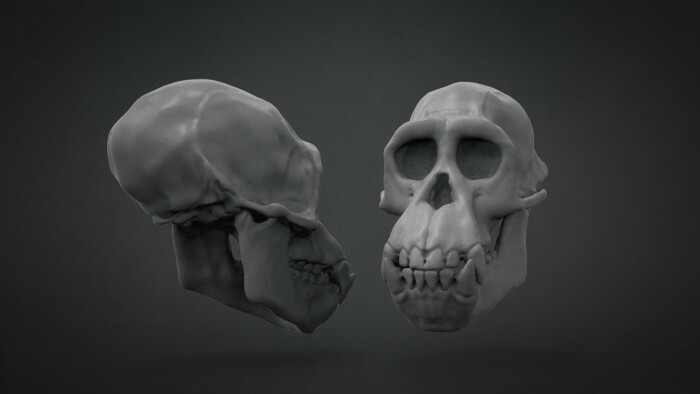 In this chapter we continue to refine the skull adding more final surface details, taking into account how the muscles attach to the skull to create the forms we are seeing in our reference. 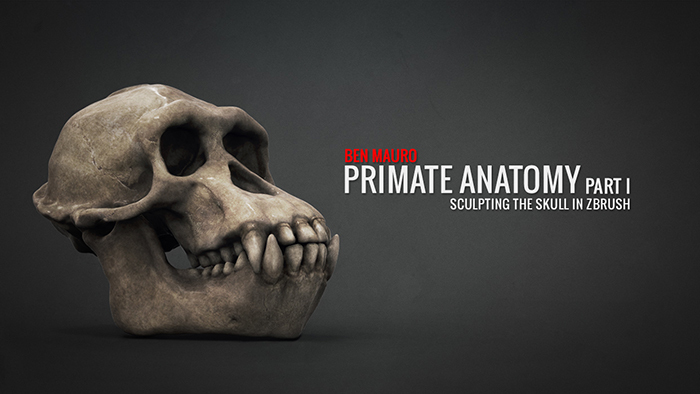 In this chapter we add final touches and proportion changes to the skull before beginning to scuplt our chimpanzee on top of this solid framework. 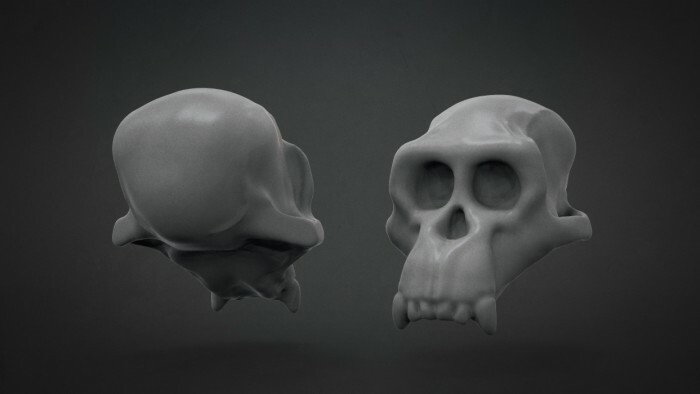 I’m intersting by this tutorial, but can we see the skull texturing ? it look amazing !! I’ll try to put something together, however if I remember correctly I used an amalgam of 3D texturing in KeyShot and retouching in Photoshop to create the overall look. Just bought it and starting, it seems great. What’s the human anatomy book Ben mention in the reference chapter? From memory it was a random impulse buy from a non-official vendor… Sorry mate, I wish knew more. Thank you so much! I’m looking forward to get into these tutorials. Anytime Hope you enjoy them! Thank you so much for this great tutorial, Ben is a great artist and it’s always a pleasure to watch his tutorials. Look forward to more tutorials in the future. This is gonna be awesome, but one thing i noticed because i use a subwoofer in my studio, is that the audio has a lot of low end. I recommend process your audio with a high pass filter around 120-180 hz. Not a big deal but just a suggestion. Copyright © 2019, BadKing.com.au Page generated in 3.84 seconds ( 100.00% PHP, 0.00% MySQL ).